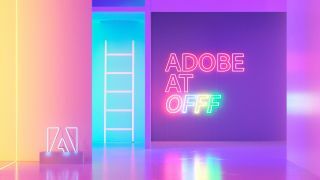 Tune in to the Adobe OFFF 2018 livestream for exclusive interviews, hot trends and product sneaks. The Barcelona edition of OFFF kicks off later this week. If you can’t make it to sunny Spain for this three-day fiesta of creativity, fear not – you can follow all the action as it unfolds, right here on Creative Bloq via the Adobe livestream (running from 24-25 May from 11am CET). You can also follow the Visual Trends panel discussion live and online via Adobe Stock Facebook Live. Now in its 18th year, OFFF offers creative inspiration and artistic innovation from world-class speakers. Adobe will be livesteaming the best bits of the festival across each of the three days, as well as offering exclusive interviews with speakers, pro portfolio advice, special product speak-previews, and one awesome competition – read on to find out more. This year’s lineup is stronger than ever, with industry-leading designers taking to the stage (or direct to your screens) to share their creative secrets. Adobe will be going live with the likes of French illustrator Malika Favre, motion designer Patrick Clair and the inimitable Stefan Sagmeister. Take a look at the full schedule here and make sure you get the livestream up and running so you don’t miss any of the action. As well as presenting on-stage, Favre, Clair and Sagmeister will also be getting stuck in and offering portfolio advice as part of Adobe’s Behance portfolio review. These are available to OFFF attendees as well as the online audience – so if your Behance portfolio isn’t getting the attention it deserves (and you’re feeling brave! ), register for a portfolio review now. Here’s another session to set a reminder for: On May 24 at 10am CET, Adobe will host an exclusive Adobe Stock panel discussion explore the hottest new visual trends. This session will bring together futurologists, photographers and illustrators to put the spotlight on ‘multilocalism’, and how travel and technology are turning the world into one interconnected, global village. You might be missing out on visiting Barcelona, but how about a trip to Los Angeles? Adobe will be offering lucky creatives the chance to win a trip to Adobe MAX 2018 in LA in October. Special guests from the Visual Trends panel debate will each design an image inspired by the Top 30 Adobe Stock search terms for Barcelona. All you need to do to be entered into the Adobe MAX prize draw is vote for your favourite image via Twitter. The competition kicks off on 24 May.